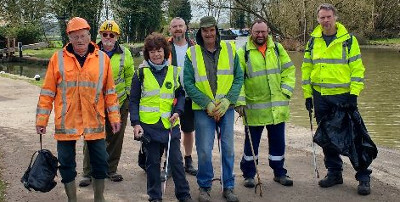 They carried out a litter pick in Lock Lane, Cosgrove and the towpath along the Grand Union Canal on the 4th April, filling six bags of rubbish from this area and then cleared a very large amount of rubbish from an area next to Cosgrove Lock which took eight wheelbarrows loads to remove. Most of the society's work is performed by our band of volunteers, Colin Levett tells us, running regular work parties throughout the year, both on weekdays and at weekends. Tasks vary from routine maintenance of our sites to major building projects.